Refugees from a deadly midyear war between government troops and Muslim rebels in the southern Philippines say they are not ready to go home, after an announced end to the fighting, over fears of lingering danger and a possible lack of reconstruction money. 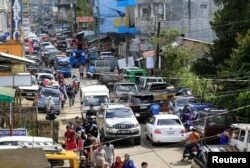 The fate of as many as 364,000 evacuees from Marawi, a city on the violence-prone southern island of Mindanao, and the surrounding area will challenge government agencies to head off new clashes and rebuild the heavily damaged city before the former inhabitants give up and move away for good. “It will take a long time. It’s not easy to really reconstruct everything,” said Miriam Coronel-Ferrer, a University of the Philippines political science professor who helped a former administration negotiate peace in Mindanao. Displaced people from Marawi City, Philippines, sit outside an evacuation center two hours away, Nov. 15, 2017. The fate of as many as 364,000 evacuees from Marawi will challenge government agencies. People’s houses were burned, destroyed or “pulverized,” to use the words of 43 families living at an evacuation center run by the nearby city of Cagayan de Oro. A lot say they lost small businesses, as well. Over the past five months, those families and about 6,400 others fled to the city, considered safe from the rebel violence that wiped out much of their hometown from May 23 to Oct. 24. At least four other cities are helping care for refugees, some of whom have moved as far away as Manila to restart businesses. Some say they ran so fast to escape gunfire they couldn’t grab possessions, including legal identification cards required to seek aid outside. Three residents of a Philippine evacuation center for Marawi war refugees pass the afternoon Nov. 15, 2017. At least four other cities are helping care for refugees, some of whom have moved as far away as Manila. In Marawi, officials are letting displaced people back into nine neighborhoods considered safe. That means 1,736 people in Cagayan de Oro, an industrial port city, can go back while more than 17,000 cannot. Authorities are set to clear another eight Marawi neighborhoods but have not set a date. Unexploded bombs may lurk in the part of Marawi where troops battled Maute Group rebels holed up in some of the buildings, a city social services worker said. A mother and her 3-month-old baby live on the floor at a Philippine evacuation center for refugees from war in nearby Marawi city, Nov. 15, 2017. The refugee shelter, built in the rain forest on a hilltop site originally for flood evacuation purposes, boards as many as five families per room along with their cooking equipment. People as young as a 3-month-old baby sleep there on foam mats. The city of Cagayan de Oro, along with 12 institutional donors and the central government, provide food, medical care and a stipend of $4 per day for casual spending, costing a so far untabulated sum of money from a budget that city workers already call stretched. Residents who stayed at evacuation centers, because of the assault of government troops against pro-Islamic State militant groups, were allowed to return to their homes in Basak, Malutlut district in Marawi city, southern Philippines, Oct. 29, 2017. The refugees say they’re not sure the government will provide enough funding to rebuild homes. Some curse the Maute Group, who are rebels founded by two brothers from Marawi. Their pledge of allegiance to global terrorist group Islamic State and cooperation with Abu Sayyaf, Sulu Sea rebels known for kidnapping foreigners, motivated troops to open fire. Other refugees didn’t know about the group before the start of the conflict, which caused 979 deaths. Animah Sedic, a 34-year-old former housekeeper in Marawi, said she was “surprised and shocked” when the war broke out. She said she would return home from the evacuation center where she has spent five months if allowed and hopes the government will pay for reconstruction. A government task force has “already come up with the financial requirements” to assess what it takes to rebuild Marawi, Philippine Budget Secretary Benjamin Diokno said on his office’s website Oct. 18. His department had committed 5 billion pesos ($98 million) for the assessment. By 2019 the government plans to lay out four times that amount for reconstruction, Philippine media say, but that’s less than half the total estimated cost. “We expect to hit the ground running on rehabilitation in the next few weeks,” his statement said. Rebuilding the predominantly Muslim city, once home to 200,000 people, will require support from the locals, Coronel-Ferrer said. Some of the city’s largely ethnic Maranao population lived in clanlike compounds with a localized hierarchy for making decisions. Residents have their own ideas apart from the government’s design for rebuilding, leaving it unclear what will happen. The government may provide reconstruction loans or grants rather than footing the whole city’s reconstruction bill, the professor said. Residents may also be able to get capital for restarting businesses that were demolished or made impossible by the fighting, she said. “The discourse is there’s different kinds of approaches that are being proposed by the Marawi residents themselves,” Coronel-Ferrer said. 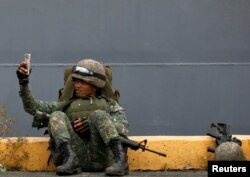 A Philippine marine soldier takes a selfie with his phone during their arrival from Marawi at port area in metro Manila, Philippines. Keeping the peace looms as a second long-term challenge. An estimated 20 Muslim rebel groups operate in or around Mindanao, the country’s southernmost island. Perceptions among Muslims that they lack autonomy or a fair share of resources after 500 years of settlement on Mindanao have caused clashes that killed about 120,000 people since the 1960s. Squelching the Maute and hobbling Abu Sayyaf in Marawi should quell violence in the short term, but survivors are likely to regroup and spark violence somewhere else without solutions to the underlying equality issues, scholars believe. Philippine President Rodrigo Duterte stepped up the fight against Abu Sayyaf shortly after taking office in June 2016. His administration is separately working out an autonomy-sharing law with another group, which signed a peace deal with the government in 2014.